If you’re considering getting a Conference Bridge for your business, but you’d like a less expensive option, or you’re looking to upgrade from a free service, but don’t want to overpay, you will likely find this article useful. First, I want to clarify what I mean by “Conference Bridge.” If you have a “Conference Bridge,” you have a phone number that you can give people that they can dial into, putting you all on a single call together, so you can have a conference call. This is how most professional conference calls are hosted. Some services advertise that they offer conference calling as a feature, but they just mean that you can add another person to your call by dialing them individually and conferencing them in. My iPhone has that feature built in, and I don’t think anyone would consider this method to be a professional way to host a conference call. You really need a true “Conference Bridge,” if you want to have a conference call. What About Free Conference Calling Services? Free conference calling solutions are obviously the cheapest way to set up a Conference Bridge, but they have one major downside: they aren’t reliable. I’ve personally had a lot of trouble with these- I’m building a house, so I have a weekly conference call with my builder- we first used freeconferencecall.com, which so frequently had problems (people’s inability to get into the call and really poor call quality were the biggest issues), that we had to switch services. We switched to Rondee.com, which has been better, but was down during our last scheduled call time, so it’s obviously not perfect either. 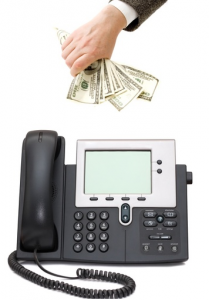 Typical Cost For Conference Calling Services? Another obvious option is to sign up for a paid conference call service like WebEx, Infinite Conferencing, or InterCall. These are typically going to be high quality services with lots of features, but they can be pretty expensive. This is especially true, if all you really need is a reliable Conference Bridge. They usually run between $20 and $50/ month or charge 3 to 4 cents per minute per participant (that would be $7.20 to $9.60 for a 1 hour conference call with 4 people). The least expensive, reliable option that we’ve found is using a virtual PBX service that includes a Conference Bridge. Virtual PBX systems are basically Google Voice-like services that are designed for business. Like Google Voice, they provide you with a number that you can use to route calls to any phone that you designate. Unlike Google Voice, they also provide features like an auto attendant, multiple extensions, corporate voicemail, etc., and some of them even include a Conference Bridge. Here is a detailed review of How Google Voice Stacks Up Against Virtual PBX. Many virtual PBX services cost less than $10/ month and some of them include full Conference Bridges for no additional charge, but we’ve only found two that don’t charge additional usage fees for the Bridge. Phone.com’s Virtual Office Product costs $9.99/ month ($8.99/ month if you prepay for a year in advance), and includes a Conference Bridge that can handle up to 500 callers at once. iTelecenter’s Basic plan is $19.95/ month and can support up to 25 callers on its. Neither of these companies will bill you anything extra for using their conference calling feature, regardless of how much you use it. If you decide to use a virtual PBX service for conference calling other than the two mentioned above, be careful to read the fine print on the plans. Some of them advertise conference calling as a feature, but they really only offer the ability to “conference” together multiple callers. They do not offer an actual Conference Bridge for people to call into. Other companies will offer a full Conference Bridge, but they will charge you per minute, per caller, which can get pretty expensive pretty fast. If you have 5 callers on a 60 minute phone call, this would equate to 300 minutes of usage for which you would be responsible. To get a better idea of what to expect when looking for in a virtual PBX service, take a look at ChooseWhat’s Virtual PBX Market Standard. It is a helpful list of features you should look for when considering virtual PBX providers. If you are still unsure about your decision, we recommend that you take advantage of one of the free virtual PBX trials we have available on our website.